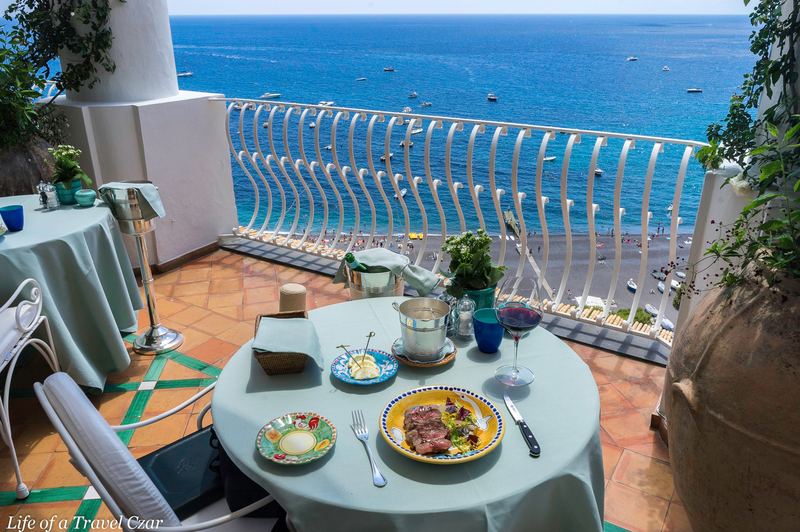 La Sponda is located within the luxury hotel Le Sirenuse in Positano. The restaurant has an indoor area with beautiful vines growing around columns and bright green tiling. 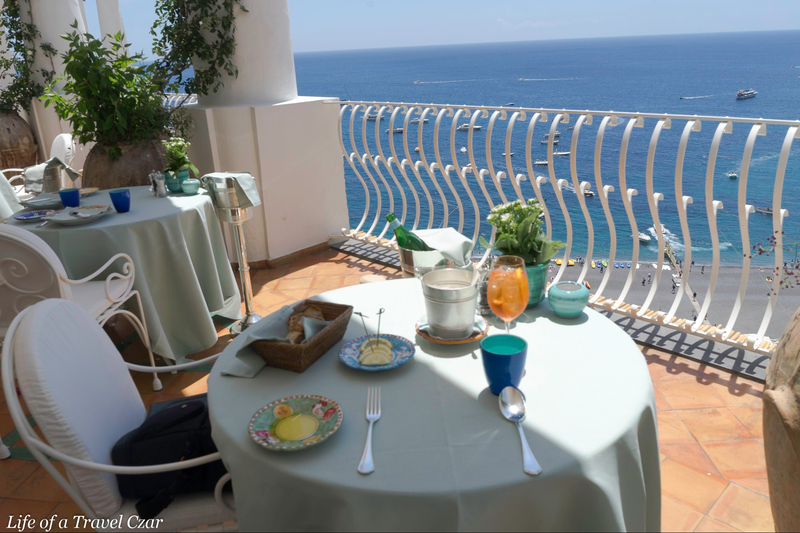 The outdoor terrace is where lunch is held and it has beautiful green table cloths with elegant table settings overlooking the beautiful blue waters of the Positano coast and the beach below. 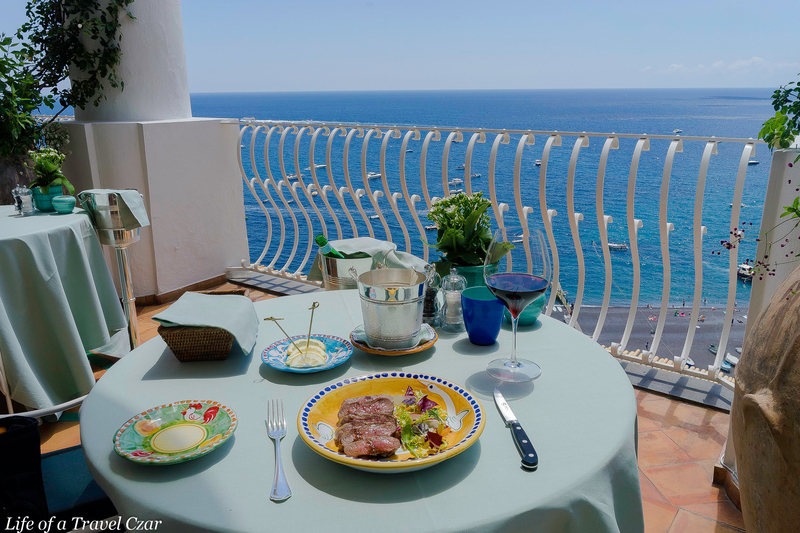 The restaurant services light Mediterranean cuisine with fresh ingredients from the local surroundings. The restaurant also has a Michelin Star. I arrive on this beautiful summery afternoon, the sea breeze is gentle and the sun provides a warmth and a radiant glow to match. The shade from the roof slowly escapes as the sun hovers across the horizon. I am taken to my seat and chill with amazement of this view. I order an Aperol Spritz to start and work my way through some complimentary freshly baked bread and premium olive oil to start the afternoon’s proceedings. 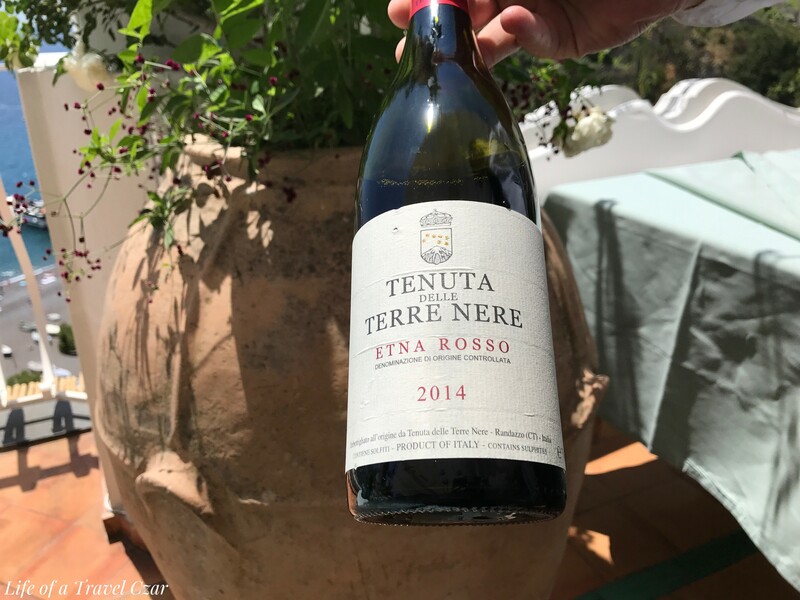 The staff are friendly and quick to respond to every query and eventually I order lunch and choose some appropriate wines to match the culinary offering. This is a beauty, a magical weaving natural flavours for a true taste experience. 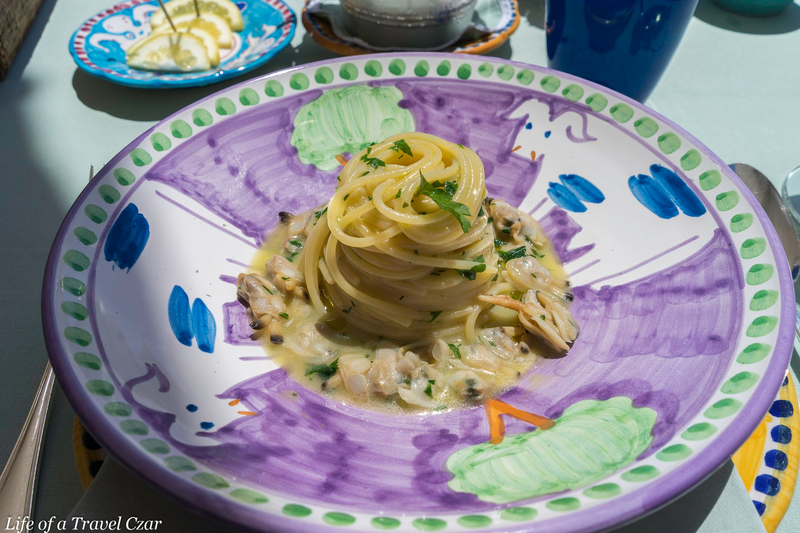 There is no real sauce added, its spaghetti cooked in clam juices with a light seasoning. There is the good sea salt flavour and richness of the clams. The pasta is cooked al dente and has lush feel on the palate. It’s a delightful dish! I pair the spaghetti with a beautiful French white wine and a beautiful wine it proves to be. It’s got some lovely mouth-watering acidity, good minerality with a lemon pith bite. A very distinct citrusy wine to pair with Vongole. The sweet starchiness of the pasta and richness of the clams is balanced by the tartness of this citrus dominated wine. This is beef fillet seared and sliced with a generous sprinkling of rock salt and served with crispy vegetables. The succulent rare beef is a treat with the mix of juicy tender centre with the smoky outer part is a joy on the palate. A good sprinkling of rock salt accentuates the flavour. There is some good textural contrast with the crispy vegetables on side. It’s simple and delivers for the palate. The wine has lovely perfumed aromas which delight the nasal senses. It works well with the beef, lovely lush cherry flavours without too much fruit strength. The wine has accommodated some nice notes of tobacco in the finish which is a pleasure. The tannins are well balanced and not to grippy. A nice match for the beef. A chocolate & almond cake which has a nutty and sticky texture and a cacao hit on the palate. 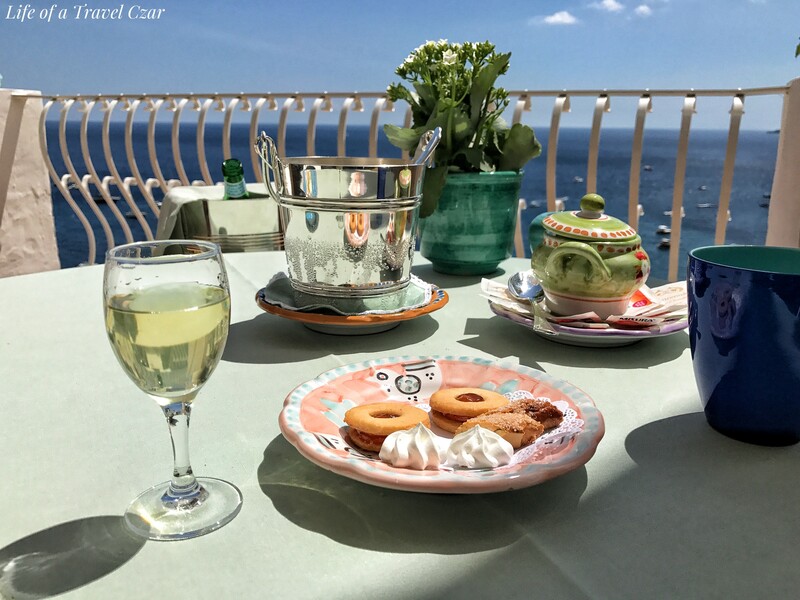 It is paired with a light creamy vanilla ice cream with a dreamy chill experience which contrasts with the cake and is the perfect tonic for the Portofino sun. 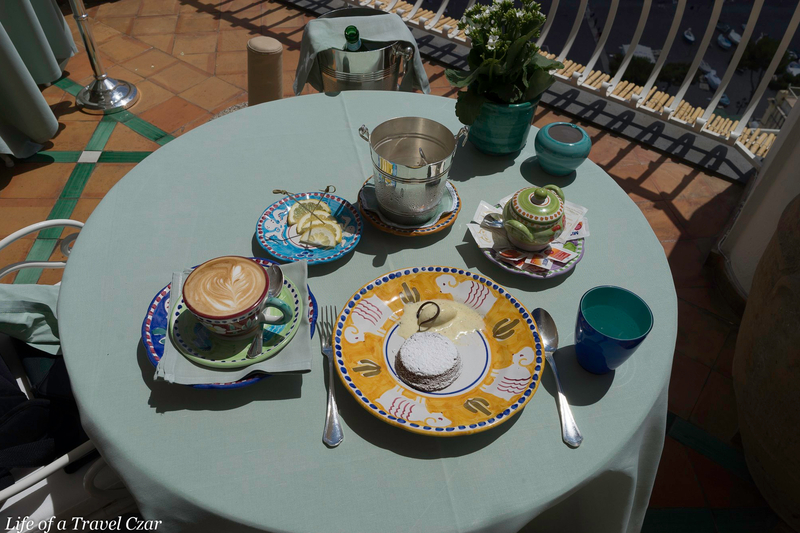 Some petit fours are brought out as the bill is settled and then venture on to spend the rest of the beautiful afternoon in this beautiful town. I wanted a photo with the coffee and the cake combined alas the coffee took a while, as such the ice cream melted…. making it a bit less photogenic. The coffee arrives and is nicely done. A very nice wake-me-up from a leisurely lunch. But what was the epitome of fine customer service they adjusted the bill for the cake. A very kind gesture which wasn’t needed as I truly had an enjoyable lunch and would have stayed all afternoon on the terrace if I could. 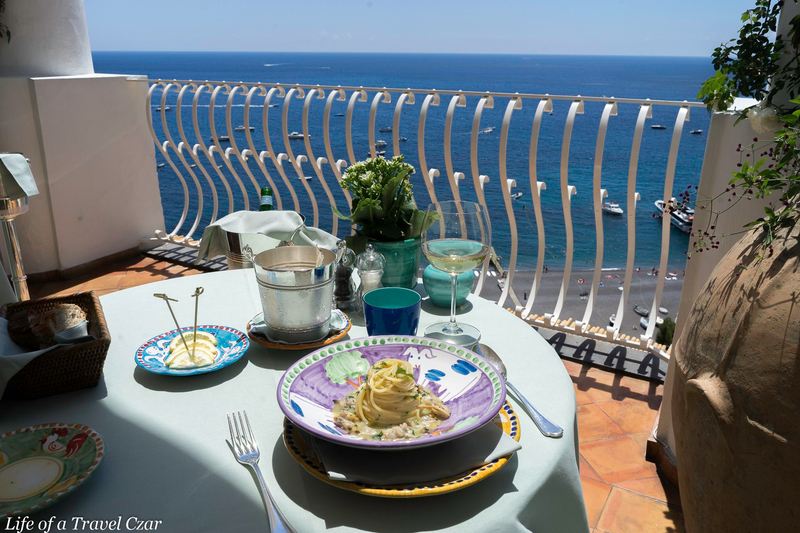 It is the best spot for lunch in Positano and the views definitely match the culinary experience. I compiled a little video of each of the courses and wine with a pan over the terrace to the ocean. It captures the lunch mood and vibe of the experience a bit better than the photos. The background music is from ‘Something’s Got a Hold On Me’ by Jessica Mauboy. I do not own any rights to the song. Could you have had a more perfect day for that lunch. I think not.Those Italians know a thing or two about cooking. The food looks amazing. I noticed the table is set for one. If you need a wingman you know where to find me.